Clinton’s face said it all. 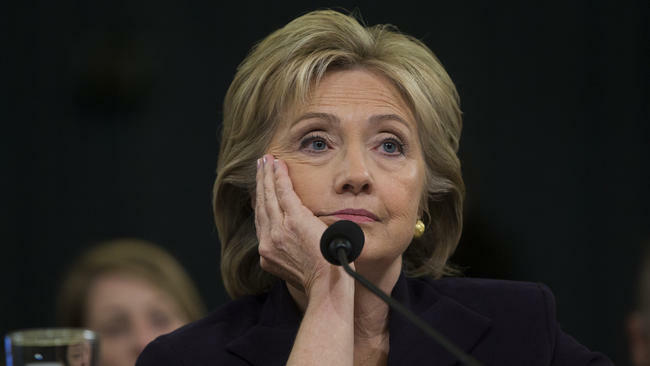 After eleven grueling, often mind-numbing hours of testimony by former Secretary of State Hillary Clinton, it seemed as if the GOP member of the Benghazi committee had met their match. Clinton remained calm, cool, and collected for most of the hearing, with Democratic members throwing barbs, while Republicans found new ways to ask the same question several dozen times. As the hearings wound to an end, I had a thought: what if this has nothing to do with Benghazi or stopping Clinton’s march to the White House? It sounds ludicrous. After all, Republicans have orchestrated Benghazi hearings for years with the goal of putting an end to Clinton’s dreams of winning the presidency, but with just a year until the general election, and a clown car of a GOP primary field, Republican members of Congress may consider Clinton all-but-invetiable. So why grill Clinton for 11 hours? Congressional Republicans have elections to win in 2016 too. Their own. The headline sounds like a Trump-ism and it probably resembles what Trump will say when he announces his run as an independent around July 2016. Here’s the thing, without a binding agreement, the pledge is nothing more than a great way for the GOP to earn media and for GOP chair Reince Priebus to look like he’s leading the party, but he’s missing a crucial element: Trump’s supporters aren’t necessarily ardent Republicans, they are just conservatives. Confusing partisanship and ideology is fairly commonplace in American politics and it remains confusing for some studying political behavior at the graduate level. Yes, partisanship and ideology are closely related, with most liberals identifying as Democrats and most conservatives identifying as Republicans, but one’s ideology doesn’t mean they are “party people.” Yes, they may tell a pollster they are a “Republican,” but that may have more to do with their ideology lining up with one particular party than the strength of their partisanship. (Essentially, the Republicans better represent a conservative ideology, therefore a conservative identifies as a Republican.) Trump attract ideologues on the right. Conservatives who fully agree that we need to kick out the “illegals” and build a gigantic wall along both the Mexican AND Canadian borders don’t necessarily rock elephant lapel pins and pendants, but they do support the tea party and other movements associated with the Republican party, but more explicitly tied to the conservative ideology. This is an important point for Priebus and other Republican bigwigs worried about the Trump-effect. 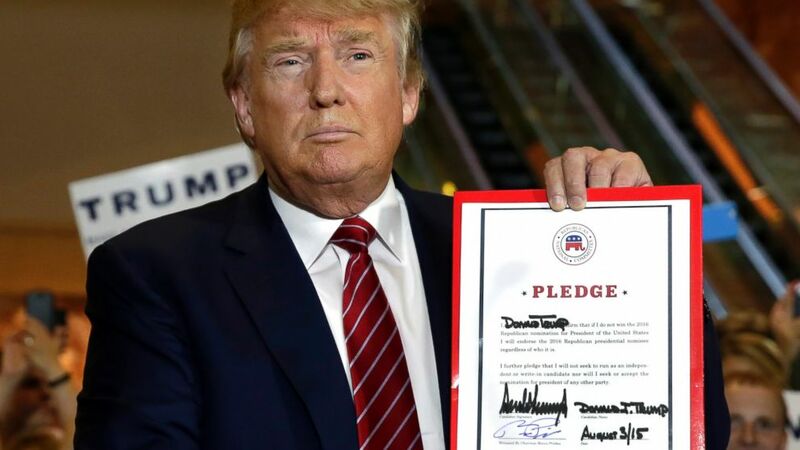 Trump can sign the loyalty pledge now, in early-September 2015 when the stakes are high for both Trump and the Republican Party, but if Trump’s support among Republican party elites starts to wane, but his support among those identifying as very conservative remains high, the likelihood Trump bucks the pledge and runs as an independent strengthens. Kanye 2020 and the end of the American democracy? 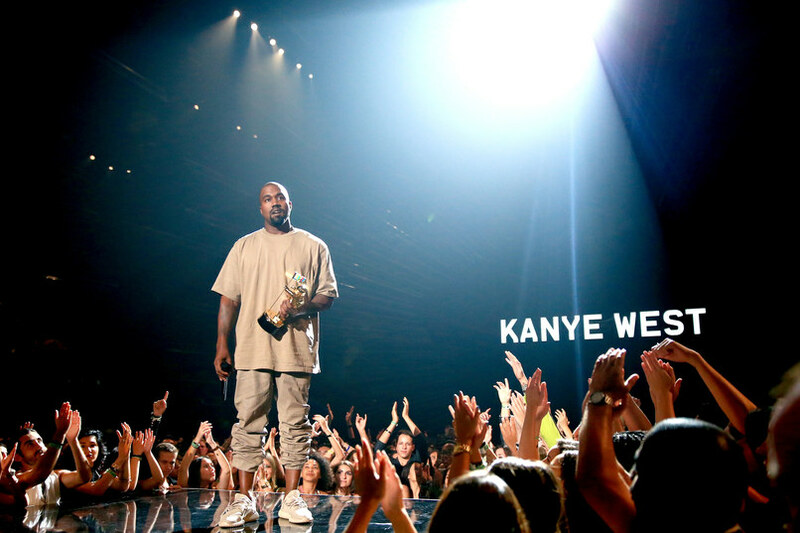 Alright, so the headline is a bit hyperbolic, but Kanye West’s rambling, 12-minute diatribe at the MTV Video Music Awards on Sunday left me grumpy about the future of our grand experiment in democracy. A few bad apples aside, Americans typically come together every four years to hire someone to run the country. It’s quite possibly the most challenging job in the country, even if it doesn’t require the skills as a brain surgeon–although Dr. Ben Carson would probably tell you otherwise. Kanye’s bizarre remarks made a mockery of our presidential system, even if Kanye’s goal was to address the candidacy of jokers like Donald Trump. However, young people who hopped on the #Kanye2020 train immediately following his remarks are sadly growing up in a country where we belittle the concept of public service, believe all politicians are self-serving and that any person has the capacity to run the country. It requires incredible intelligence, patience, and tenor to be president. The only adults in the room. Will that lead one of them to victory next November? Last week, the Republican circus moved from Cleveland, to Atlanta, with no signs of slowing down. Early poll numbers suggest Donald Trump wasn’t permanently damaged by his erratic–and predictable–behavior at the debate, while Jeb! Bush and Scott Walker’s poll numbers sank. Of course, all of this is subject to change, just like a weather forecast. Meanwhile, the juxtaposition of the Democrats and the Republicans grew wider. As Vermont Senator Bernie Sanders continues to draw record crowds, demonstrating the frustration among Americans on the left, Hillary Clinton unveiled plans for “debt-free college,” among other major policy changes for the millions suffering under the burden of student loans. Whether Clinton’s plans for student loans are a silver bullet remains to be seen–not including full out debt relief may stoke the ire of many progressives–but it is refreshing to see the adults in the room actually discuss policies that matter. While Republicans debated how best to repeal the Obama years, what their faith means to them, and how best to outflank one another from the right, few provided details into the issues that are truly defining the United States today. In fact, by the time the RedState Gathering started in Atlanta, many Republicans and pundits were focused on Donald Trump’s crass comments toward FOX News host Megyn Kelly, not policy, nor what it takes to govern. While policy and governing may come off as boring, it may be Democrats’ ticket to a third consecutive term. Gray Matters: It may not be clear what exactly is making you feel so uneasy, but at least it’s making you look “more distinguished”, am-I-rite? Could it be the latest natural invaders? Or the repeated man made disasters? Out-of-date laws gave citizens pause that the electorate’s choice contained flaws. The re-election of President Obama brought us the beloved conniption fit heard ’round the world, the election of Elizabeth Warren has put the financial leaders in a tizzy, and “The Connecticut Effect” does NOT seem to be abating any time soon. With falling ratings, Fox News has been reduced to manufacturing stories to rouse their remaining rabble, er, audience. Lastly, the mere possibility of Hillary Clinton running for President in 2016 is already giving the GOP a collective Panic Attack! So, good times after all. May you always be in tune with The Music of the Spheres. Can we do anything about gun violence in the U.S.?